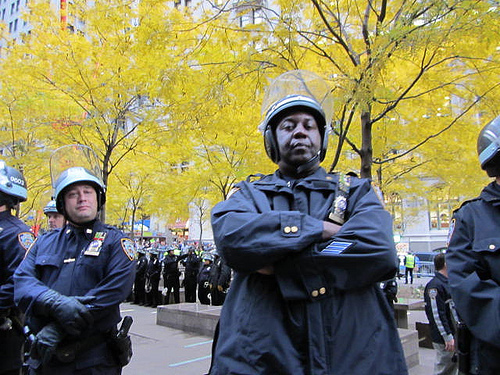 During the 18 days Occupy Wall Street has commandeered lower Manhattan’s Zuccotti Park, confrontation appeared to be limited to clashes between protestors and police. But with growing support, vocal public dissent has begun to penetrate the ranks of the Zuccotti stronghold, leaving protestors scrambling for methods to manage the swollen ranks of the occupied faithful. One such method is the creation of Occupied Security, a rag tag group of 20 or so protestors that monitors the park in search of altercations. 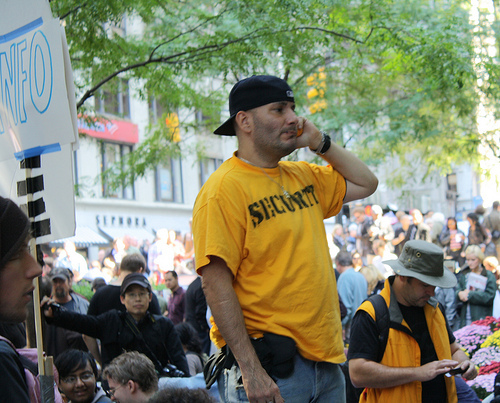 Suited up in a yellow t-shirt with the word “security” crudely stenciled on the front, Occupied Security member Paul Isaac, 42, of Flatbush, Brooklyn, stood atop one of the many elevated park planters, relaying information via a hand held radio to other security members scattered throughout the area. But the dissenter remained, and the situation escalated, causing Patrick Dore, 23, of Bay Ridge, Brooklyn to jump into action. Dore said he was a part of a de-escalation force within the protestors, a group separate from the security force that sought to maintain the peace by encouraging others to ignore dissenters and walk away from conflict. 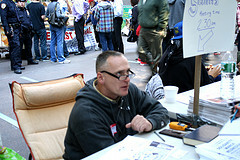 In spite of the protestors collective efforts, the dissenter remained, prompting Dore and others to seek out police assistance. The police declined to help end the situation, Dore said, because the officers maintained that the confines of the park were an open sphere of protest. “If that had happened outside of the park and on the sidewalk than it would have been a different story,” Dore said. The situation diffused itself, as the dissenter retreated out of the park and into the ranks of the public, leaving to jeers from the protestor faithful. Although Dore failed to obtain police assistance, many of the security force members believed that police would have no problem coming to their aide. Though the officer declined to speak on the matter, the disparity between police orders and protestor security forces poses a potential risk, should situations escalate. 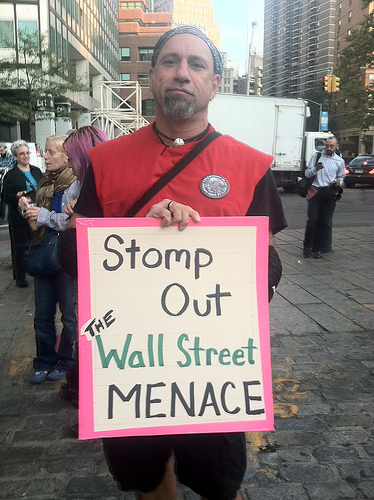 Ruso said there have also been incidents involving not just those with opposing views coming into the camp, but also fights within the Occupy Wall Street crowd.